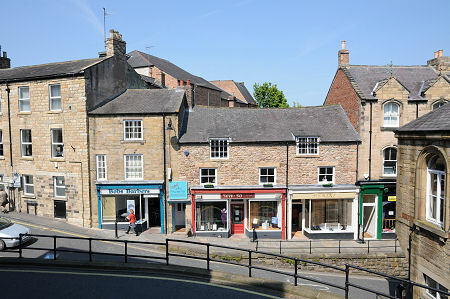 The town of Hexham stands on the River Tyne some 20 miles west of Newcastle upon Tyne. It is the largest town in western Northumberland, and the furthest upstream on the River Tyne: which is formed by the coming together of the River North Tyne and River South Tyne a mile and a half to the north west. Today's motorist needs to take a conscious decision to enter Hexham. Since 1977 it has been bypassed by the A69, the main Newcastle to Carlisle road. This follows a line along the north side of the valley of the River Tyne, some three quarters of a mile to the north of the town. When you see how busy Hexham is today, it is difficult to imagine what it would have been like when it was traversed by east-west through traffic. Hexham is also bypassed to the north by the main Newcastle to Carlisle railway line, which at this point closely follows the south bank of the River Tyne. This was possible because historically - and it is a town with a lot more history than most - Hexham developed on the summit of the ridge which rises to the south of the River Tyne. This left space for the later development of the railway in the valley below, though the layout can leave first time modern visitors slightly at a loss trying to work out exactly how to drive into the town centre, and how to park there. The solution, in both cases, is not to bother. 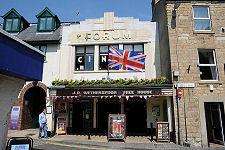 There is a very large car park on your left as you enter Hexham from the A69. This Wentworth Car Park is home, amongst other things, to the Tourist Information Centre, a Safeway Supermarket and the Wentworth Leisure Centre. If you park here it is only a relatively short and fairly gently uphill walk past the TIC to the town centre itself. This is far better than trying to engage with a street plan that was certainly not designed with cars in mind. If you follow this suggestion, then you approach the centre of Hexham up the very attractive and largely vehicle free Wentworth Place. En route you pass on your right the Old Grammar School, built in 1684. At the top you encounter on your right what at first sight seems for all the world to be a castle. This is Hexham's Old Gaol, which was built in 1330 to serve as a prison for the prisoners of the Archbishop of York, who at the time held the title of Lord of Hexham. It is said to be England's earliest purpose-built gaol. Not far beyond you encounter a second contender for the title of "Hexham Castle": this time in the form of the Moot Hall. This was also built in the 1300s, to serve as a gatehouse to a walled and defended area which included the Old Gaol. Also within the area was the Baliff's Hall, the residence of the man who governed the area on a day-to-day basis on behalf of the Archbishop. The Scots under William Wallace had laid waste to Hexham in 1296, and the new defences were intended to avoid a repetition. On the far side of the Moot Hall is Hexham's Market Place. This forms the focal point of a town which in many ways still retains a layout that dates back to medieval times. To the north east, Hallstile Bank descends towards the floor of the river valley, while to the north west, Market Street was once the main shopping street and now offers a very attractive prospect of old buildings. Hexham swimming baths comes as something of a surprise, being built in 1975 within a wool warehouse originally built in 1885. 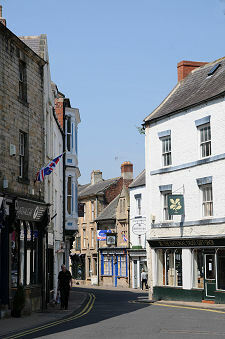 Running south from Market Place is Fore Street, which today serves as home to many of Hexham's shops. 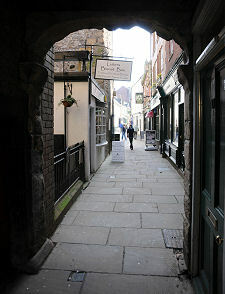 Less obvious is the narrow archway on the north side of the Market Place which leads to St Mary's Chare, a narrow street with a huge amount of character and the sort of bookshop you wish you could find nearer home, Cogito Books. The buildings either side of the archway still show some evidence of the Chapel of St Mary, which once stood on this side of the Market Place. The Market Place is worth exploring. 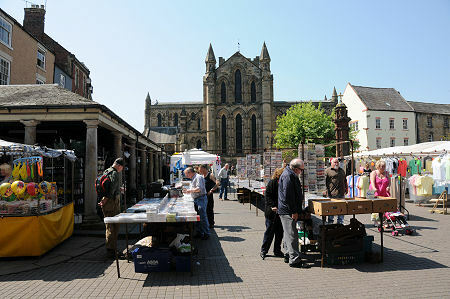 Hexham Market was first held in 1239 and it remains home to a weekly general market and a fortnightly farmers' market. It is dominated by the Moot Hall at one end, and the east gable of Hexham Abbey at the other. Within the Market Place itself is The Shambles, a colonnaded shelter erected in 1766 to protect market traders from the Northumberland weather. 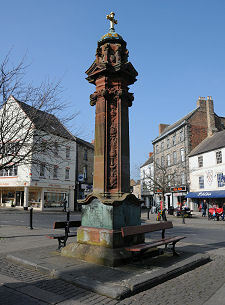 Also within the Market Place is the red stone Market Cross. We discuss Hexham Abbey on our feature page about it, but its story begins in about 674 when Etheldreda, Queen of Northumbria, granted a large estate to Wilfrid, the first native Saxon to serve as Bishop of York. A church was built here whose crypt still remains, and it seems reasonable to believe that a settlement quickly grew up around the the church. Today the Abbey still dominates the town, and you can get an excellent feel for the centre of Hexham by walking around the Abbey and its precincts. To the south of the corner formed by the Abbey and Market Place is Beaumont Street. One side of this is home to some fine buildings, including the Queen's Hall. This was built in 1866 as the Town Hall and Corn Exchange, and now serves a range of functions including gallery and library. On the opposite side of Beaumont Street is a park in what was originally the Abbey Grounds. Here you can find Hexham's war memorial and a bandstand. Continuing around the west side of the Abbey brings you to the grounds of Hexham House, a fine house dating back to 1723 which backs onto Market Street. In the grounds is a bowling club, and from here you can complete your circuit of the Abbey, passing evidence of old ecclesiastical buildings as you do so. Although Hexham's origins date back the best part of a millennium and a half, by the 1800s it was best known as a centre for the manufacture of leather and leather goods. In 1823 it was noted that 117 men and boys were employed in the town as leather dressers and glove cutters, and 1,111 women as sewers. The town processed some 80,000 skins of dressed leather into over 23,000 dozen pairs of gloves annually. There were additionally some 20 men employed in the town's four tanneries, who between them processed 5,000 hides and 12,000 calf skins for local saddlers, bootmakers and cobblers. Hexham was also known for its hats, with 16 master hatters in the town, and 24 other employees. The town also had two steam powered woollen mills, and two rope works. Today's Hexham is thankfully free of the noxious fumes produced by tanneries, but it remains a bustling place with a sense of historical continuity that is really quite unusual. To some, the town is best known for Hexham Racecourse, which stands in a magnificent, if slightly remote, ridge top location a mile and a half to the south west.